Desarrollado en verano de 1944 por la Oficina de Construcción de la Planta de Kirov (Leningrado). En otoño el prototipo superó las pruebas. Nunca se produjo en serie ni entró en servicio. The IS-6 replaced the KV-5 as the Soviet Tier 8 premium heavy tank available through the ingame store from patch 0.7.3. It is also currently available from the gift shop as a bundle with a garage slot all year-round. It is the cheapest of the Tier 8 premium heavy tanks, and the third cheapest of all the Tier 8 premium tanks currently available in the ingame store, after the T26E4 Super Pershing and the 8,8 cm PaK 43 Jagdtiger. It has good armour and decent mobility, but an inaccurate gun with fairly low penetration. Second best damage-per-minute of the Tier 8 premium heavy tanks, after the KV-5. Preferential matchmaking (Tier 9 maximum). Thick, well-angled hull armour from the front and sides. Relatively weak driver's hatch and turret front. Terrible gun accuracy and aim time. Most Soviet heavy tank players who went to the IS line should feel right at home with the IS-6. In many ways, the IS-6 is essentially an IS that has been moved up to Tier 8, but still meets the same opponents. It plays quite similarly, but trades a little mobility for much better armour. The 122 mm D-30 is for all intents and purposes the same as the IS's top gun, the 122 mm D-25T (and in fact, the D-30 was historically a modified version of the D-25T). It has the exact same penetration (175 mm), the exact same accuracy (0.46 m), and the exact same aim time (3.4 s), all of which are quite terrible. Using the gun at ranges above 300 m requires a lot of patience in allowing the gun to fully aim in, and even then the gun can and will miss. It works best at medium to close ranges. The rate-of-fire and alpha damage are quite good, however, and at shorter ranges the IS-6 can use its superior damage output to its advantage, especially against the Löwe and T34. An Enhanced Gun Laying Drive and a Vertical Stabilizer are highly recommended. The limited ammunition capacity of only 30 rounds coupled with the high rate-of-fire means that running out of ammunition is a very real possibility, and shots should be taken with care. The IS-6 is well-protected compared to other tier 8 premiums. Unlike the KV-5, which depends on raw armour thickness and high HP to absorb hits, the IS-6 relies on its very well-sloped armour to bounce incoming enemy fire. It also lacks the distinct weak spots that the KV-5 has, although the driver's hatch can be considered a weak spot. While not nearly as thick as the T34's or IS-3's turret front, the IS-6's turret is still quite reasonably well-protected, and has better side armour. Angling and sidescraping will really boost the IS-6's survivability, especially since the side armour is just as thick as the front and is either sloped or covered with some form of spaced armor. The rear of the turret and hull are significantly weaker than the other sides, however, and one should be very careful about enemy tanks getting behind the IS-6. When angling the IS-6, one must be careful not to expose the hull "shoulder plates" too much, as too much angling of the front plate will at the same time straighten out one of the "shoulders", making it easier to penetrate. Probably more than any of the other Tier 8 premium heavy tanks (with the distinct exception of the very mobile FCM 50 t) the IS-6 is better at reacting to changes of the battlefield. It has very decent mobility for a heavy tank, which gives it the flexibility that some of the other Tier 8 premium heavy tanks lack, although the IS-3 is superior in overall mobility. The mobility combined with the good armour allow the IS-6 to get in close, where it can make the best use of its gun. Perhaps the IS-6's greatest asset is its preferential matchmaking, which it shares with the KV-5, FCM 50 t, T26E4 Super Pershing, and 8,8 cm PaK 43 Jagdtiger. It will only ever meet Tier 9 tanks at worst under normal circumstances. As a Tier 8 premium tank, the IS-6 is very good at making credits. However, the expensive ammunition, particularly when shooting APCR, will quite noticeably cut into its profits, especially if many of the shots miss. In the game's files and in official matchmaking charts, the IS-6 is known by its Ob'yekt (Object) designation: Object 252. As a premium tank, it is generally not recommended that a dedicated crew be run on the IS-6. Instead, one should use an existing Soviet heavy tank crew. If none exists, however, then the following options are probably the most viable. Repair as the first skill for all the crew members is a solid choice, allowing broken tracks or other damaged modules to be brought to operational condition as quickly as possible. Repair kits can thus be saved for more important modules like the gun or ammunition rack. A more specialized set of first skills would be Repair (Commander and Loader), Snap Shot (Gunner), and Smooth Ride (Driver). The loader only has perks available, which are not useful until they have reached 100%. Repair is the most viable option for the loader, which may later be swapped out for his perks. The combination of Snap Shot and Smooth Ride act like a Vertical Stabilizer, reducing the accuracy penalties while moving in a straight line or turning the turret. When combined with an actual Vertical Stabilizer, this can make a significant difference, especially given the IS-6's terrible dispersion and aim time. Mentor may also be used instead of Repair if the emphasis is on getting the other crew members' skills up faster. Smooth Ride may be substituted with Off-Road Driving for improved overall mobility or Clutch Braking, which is always useful on any heavy tank for the increased hull traverse, allowing them to counter circling tanks better. Upon reaching 100% on the first skills, dropping the commander's skill for Sixth Sense is highly advised, as it is one of the most important perks in the game. It is especially valuable in matches with artillery, since in a heavy tank being spotted usually means an artillery round is on its way towards you. The loader's skill may be dropped in favor of Safe Stowage. Brothers-in-Arms is a good perk to have on any tank, but requires all crew members to have it at 100% before it works. The bonus to crew skills is particularly noticeable when combined with Improved Ventilation. It improves nearly every aspect of the tank's performance, but is generally better saved for later in favor of more important skills and perks like Repair and Sixth Sense. As a premium tank, the IS-6 has no upgrades. Following the Battle of Kursk in the summer of 1943, the Soviets were able to acquire a few examples of the new generation of German tanks, most notably the PzKpfw VI Tiger heavy tank (known as the "T-6H Tiger" to the Soviets) and the Panzerjäger Tiger (P) tank destroyer, better known as the Ferdinand (designated the "T-6P Ferdinand" by the Soviets). After studying these vehicles, the OGK NKTP (Otdel Glavnogo Konstruktora Narodniy Kommissariat Tankovoy Promishlennosti - Main Design Department of the People's Commissariat of Tank Production) developed a keen interest in some of their new features, particularly the neutral steering capabilities of the Tiger and the electrical transmission of the Ferdinand. They were found to make driving the tanks a lot easier, and the OGK NKTP began considering the possible incorporation of these features into Soviet tanks. Between the 13th and 17th of November 1943, the OGK NKTP, along with the VAMM (Voennaya Akademiya Mekhanizatsii i Motorizatsii - Military Academy of Mechanisation and Motorisation) and the NATI (Nauchniy AvtoTraktorniy Institut - Automobile and Tractor Research Institute), began work on further increasing the IS-2 heavy tank's firepower and protection by developing a heavy assault tank. The project was originally intended to produce a tank with a rear-mounted superstructure and an electromechanical transmission similar to that of the Ferdinand, and was led by Deputy Chief of the GBTU (Glavnoye Bronyetankovoye Upravleniye - Main Tank Directorate) I. Lebedev. Early the next month, the design bureau of the Experimental Plant No. 100 in Chelyabinsk, under the leadership of Zhosef Kotin, designer of the KV and IS heavy tanks, began work on a new heavy tank project. 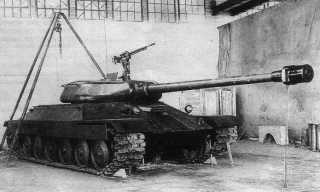 Eventually, two designs for the IS-6 were submitted, both in the "classical" tank configuration. On 8 June 1944, the NKTP ordered the Experimental Plant No. 100, along with the Uralmashzavod (Ural Machine Plant) to begin design and construction of the two IS-6 designs as the Ob'yekt 252 and Ob'yekt 253 respectively. Preliminary design work had already been completed by the Experimental Plant No. 100 under A. Yermolayev, and most of the remaining design work would be the responsibility of Uralmashzavod, as the ChKZ (Chelyabinsk Kirov Zavod - Chelyabinks Kirov Plant), with which the Experimental Plant No. 100 was associated, was also preoccupied with the production of existing tank designs, as well as with work on the Ob'yekt 701 heavy tank (the prototype of the IS-4). The Experimental Plant No. 100 would be resposible for construction of the prototypes, while the Uralmashzavod would be responsible for assembly and testing of the prototypes. Strictly speaking, there were two different tanks which received the same designation IS-6: the Ob'yekt 252 and the Ob'yekt 253. The IS-6 featured ingame is the Ob'yekt 252. It was manufactured in October 1944, and can be easily distinguished from the Ob'yekt 253 by the large-diameter roadwheels and lack of track support rollers. The suspension had previously been tested on the IS-3 experimental heavy tank (Ob'yekt 244, not to be confused with the IS-3). It was armed with the 122 mm D-30, an improved version of the 122 mm D-25T (not to be confused with the later 122 mm 2A18 howitzer, which also had the name of D-30). The D-30 was equipped with a shell rammer for increased rate-of-fire, and also had a compressed gas system to purge the barrel of gun fumes after firing. It was fitted with a 700 hp V-12U diesel engine and a conventional mechanical transmission, while the Ob'yekt 253 was fitted with the new electro-mechanical transmission. The Ob'yekt 252 underwent factory testing from 8 to 27 November 1944 before being sent, along with the Ob'yekt 253, for further testing at the NIIBT (Nauchno-Ispitatyelniy Institut BronyeTekhnika - Research and Testing Institute for Armoured Vehicles) testing grounds in Kubinka. Comparative testing with the Ob'yekt 701 showed that both IS-6 prototypes were broadly equivalent to it in firepower and mobility, but were inferior in armour protection. Neither IS-6 design was eventually selected for production; the Ob'yekt 252, with its mechanical transmission, was found to offer no significant advantages over existing heavy tanks, while the Ob'yekt 253's electrical transmission was found to be too bulky, too unreliable, and required too much space for the cooling units. The increased weight of the electrical transmission also reduced the vehicle's maneuverability, eliminating any advantages in handling the electrical transmission would have provided. 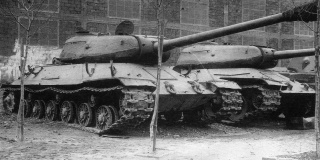 Further development of both IS-6 designs was thus halted. Esta página fue modificada por última vez el 25 oct 2016, a las 10:40.